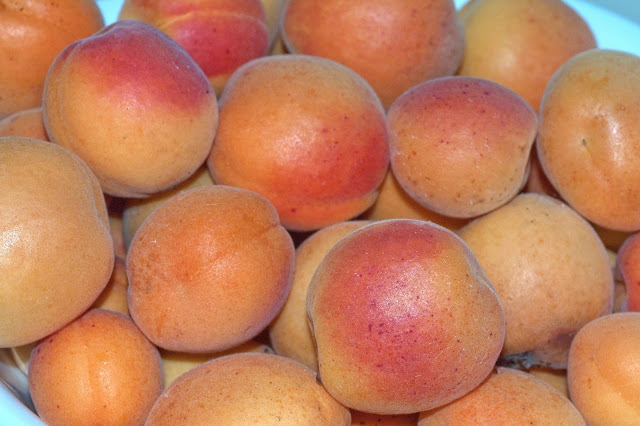 This week our Blenheim apricots were fully ripe and ready for harvest. 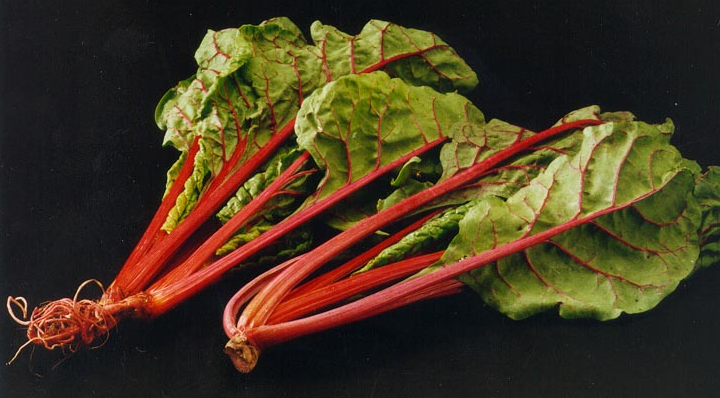 This variety is unquestionably the most delicious, but its delicate nature means it doesn't keep or transport well. Home gardeners have only a few days to enjoy these before they begin to over-ripen so it's best to enjoy as many as possible fresh and then preserve the rest. For the last few years we've been experimenting with a variety of food preservation methods for fruits and vegetables from our garden including canning, freezing, pickling, fermenting and drying. Unlike freezing which everyone has familiarity with today, the other forms of food preservation are a bit of a lost art. Something grandma may have done but not a skill that was transmitted to the next generation. Many folks are fearful of canning because they are concerned about getting botulism or being scolded by hot water or steam. These fears are really exaggerated. Canning is safe and easy to do. You just need to follow a few rules. If you would like to give canning a try, here is our Basic Canning Guide. We'll discuss two methods of canning and the equipment you need to do both kinds. The objective is not to make you a canning expert in one article. Rather, this is to give you an overview of the process and equipment so that you can decide whether you want to give it a go. 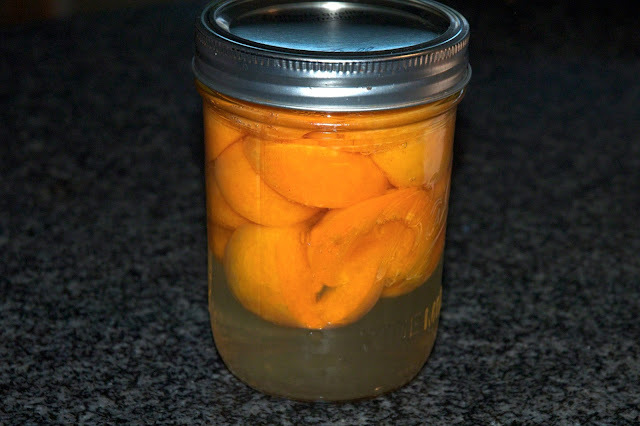 · Put your fruits or vegetables along with the proper additives into jars. The additives (lemon juice, vinegar/spices, or sugar syrup) aid in food preservation and allow you to can at lower temperatures. The proper additive will vary depending on what you are preserving, but will be listed in your recipe. · Boil for 10-50 minutes depending on what you are canning and the size of the jar you are using. You can find processing times listed in the USDA Complete Guide to Home Canning, your pressure caner instruction manual, or at cooking and caning web sites on the Internet. The only equipment you need to do hot water bath canning is a large stock pot, a pair of canning tongs to remove hot jars from the pot, and special canning jars. These canning jars are made of thick glass to withstand the heat of the canning process and a special lid with a rubber gasket seal. 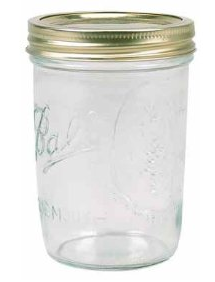 Canning jars are manufactured by two companies (Ball and Kerr) and are widely available at hardware stores, Wal-Mart and other retail locations. Now here's the rub... The hot water bath process is good for many, but not all, canning applications. Specifically, it's good for jams and jellies (sugar syrup additive used), canned tomatoes (lemon juice additive used) and pickles (vinegar and pickling spice additive used). If you want to preserve green beans, but don't want to add vinegar and pickling spices which will alter their flavor, boiling water alone will not be sufficient to prevent your food from spoiling. You'll need to heat the food you are preserving to a temperature above that of boiling water and will need a pressure caner to accomplish this. Pressure canning is a process which allows you to heat your canned vegetables and fruits above the temperature of boiling water (212 degrees Fahrenheit or 100 degrees Celsius). As I mentioned above, by canning using higher temperatures, you're able to preserve a wider range of fruits and veggies and to forgo the use of additives in some cases. Pressure canning works by using steam to do the preservation. Under pressure, steam can reach much hotter temperatures than boiling water --generally temperature between 228 to 250 degrees Fahrenheit (107-118 degrees Celsius). I should also mention that pressure canning can be used to do all of the same foods that can be done using the hot water bath method, but to complete the canning process faster because you're using a higher temperature. · To do pressure canning, you prepare your fruits or vegetables according to the recipe you are following. This will be very similar to the hot water bath process. 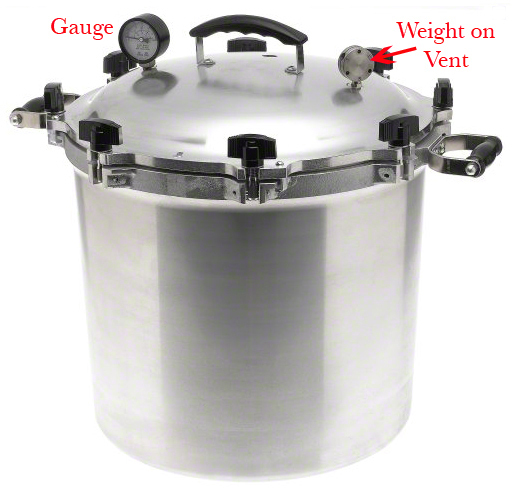 · Fill the pressure canner with water so that the water level is about 1.5 inches above the bottom of the pot. · Place your jars into the pressure canner. You will put the jars onto a rack that sits just above the bottom of the pot in your pressure canner that prevents the cans from sitting directly on the hot bottom of the caner. · Lubricate the metal seal on the cover of the caner with a little Vaseline to prevent sticking and then screw down the lid being careful to gradually and evenly tighten opposite wing nuts. This ensures that the cover will be properly sealed. · Bring the the water to a boil. You'll see steam escaping from a small vent at the top of the pressure canner. · Place a weight (supplied with your canner) on the vent using a set of kitchen tongs so you don't get burned by escaping steam. The weight will have settings for 5-15 pounds of pressure. Use the setting specified in your recipe. · Steam for the time given in the recipe. · When the cooking time has elapsed, turn off the stove. · Let the temperature/pressure gauge of your caner return to 212 degrees Fahrenheit/0 pounds of pressure. · Gradually remove the hot weight from the pressure canner using a kitchen tongs so you don't get burned. · Open the top and remove your preserved cans. Allow to cool. There are two devices on the market - pressure cookers and pressure canners. If you are canning fruits and vegetables, you want to buy a pressure canner. Both devices work on the same principle of using steam to do the heating, but canners are larger and designed for caning jars. Cookers are too small and the USDA warns against using them for canning. A good brand of pressure canner is All American but there are other good brands on the market. You can buy a variety of different sized pressure canners, but a 21 quart pressure caner is a good size for home caning applications. The canner is basically a stock pot with a lid that can be screwed down to hold in pressurized steam. The lid of the canner has a gauge on it that will tell you the pressure in pounds per square inch (PSI) and the temperature within the pot. There is also a small vent pipe on the top of the pot that allows steam to escape. You control the pressure withing the pot (and hence the temperature) by regulating the amount of steam that is able to escape through this vent pipe. You regulate the pressure by placing a small weight (supplied with your pressure caner) on top of the vent. My weight has three settings on it and allows steam to escape so that the pressure in the pot is 5, 10 or 15 PSI. If you want to can, I recommend that you purchase a copy of the Ball Blue Book on canning. 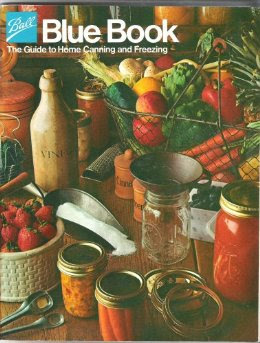 This is widely available and will give you recipes and detailed canning instructions for almost every type of fruit or vegetable.... green beans, corn, tomatoes, cucumbers (pickles), strawberries, apricots, peaches etc. etc. It's well worth the $18. You can find it at Amazon.com if it's not in your local store. A portrait of author JK Rowling (Harry Potter book series) eating eggs for breakfast. This will make the British Egg Board pretty happy. The portrait was done by artist Stuart Pearson Wright who has painted portraits of many British celebrities including members of the royal family. "Do chicken's have lips?" is a sarcastic expression that is used to answer any rhetorical question. 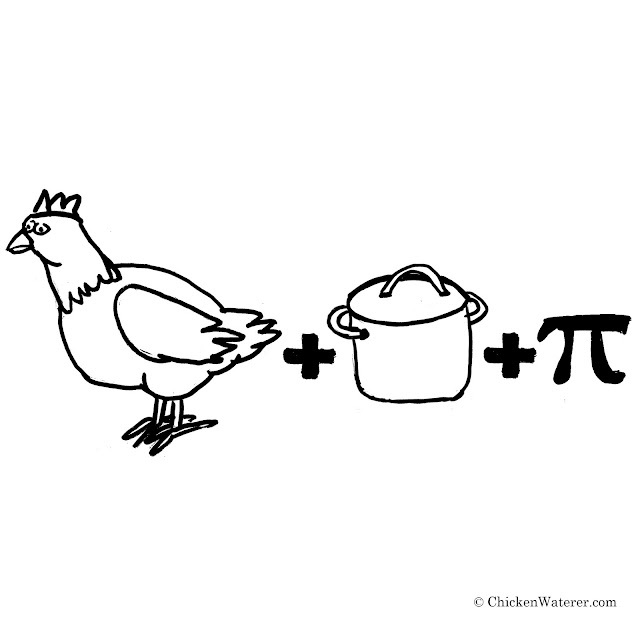 However, one could just as easily say "Do chicken's have teeth?" because they obviously don't. That brings us to the topic at hand today -- chicken grit. 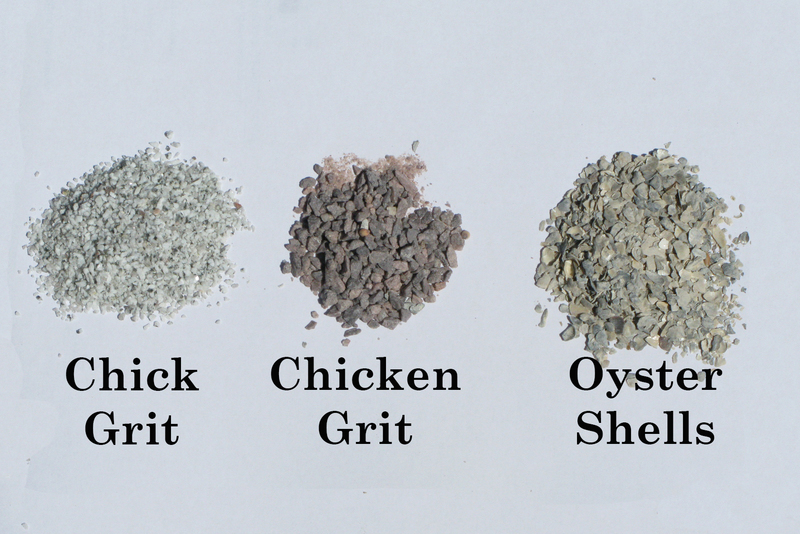 Grit is mixture of small pebbles or crushed stones that chickens eat in order to help them digest their food. They need grit because chicken's don't have teeth and are not able to chew their food to aid digestion. Instead, they pass the food into an organ called the gizzard where it is ground up. 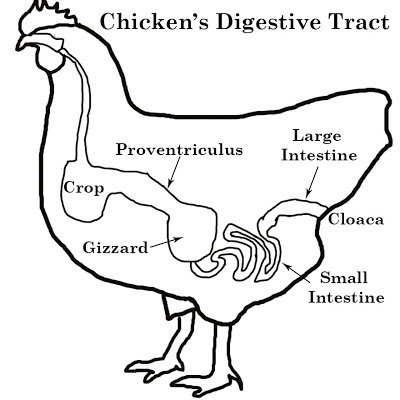 Chickens consume food with their beaks and pass it into a large sack called the crop. The crop is really just a storage bag and allows the chicken to eat large quantities of food quickly so they are not exposed to predators for long periods while they are eating. The food is then sent to the proventriculus where it mixes with enzymes that begin the digestive process. However, the food particles may be too large for the chicken to effectively digest and so the food and enzymes travel next to the gizzard for further processing. The gizzard is a specialized part of the digestive tract that is constructed of thick muscular walls where food is ground up. You can think of the gizzard as a gristmill for grinding up the food. And to take the analogy a step further, the grit is the millstone for that gristmill. The gizzard squeezes against the food particles and rubs them against each other and any grit contained in the gizzard. The combined action of gizzard squeezing and the grit, or small stones, rubbing up against the food particles reduces the food to a more digestible size. The ground up food and digestive juices then move to the small intestine where they are absorbed. 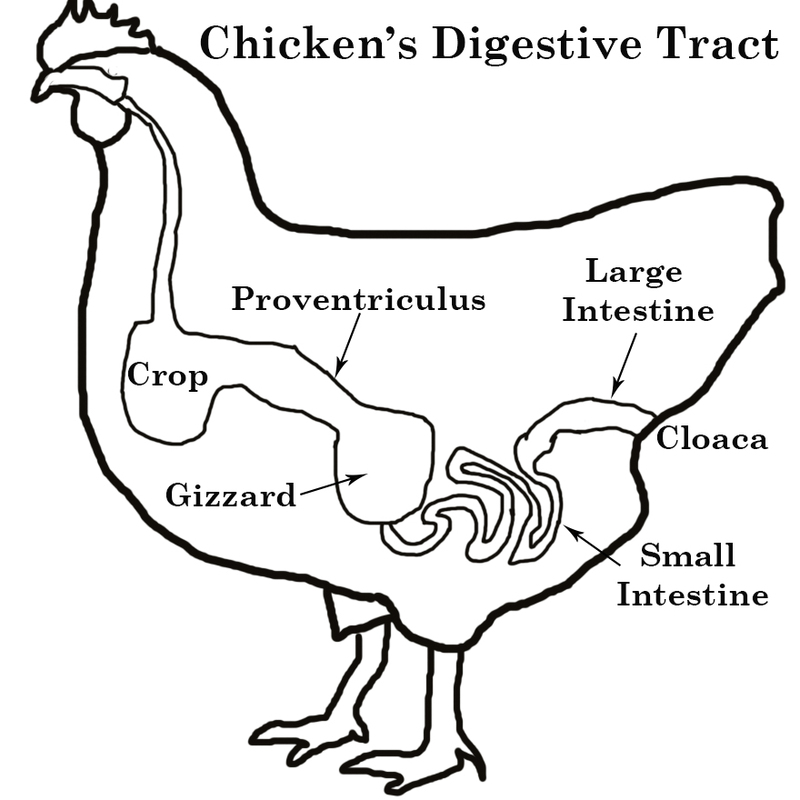 The grit goes along for the ride and are eventually excreted through the chicken's cloaca. Do Your Chickens Need Grit? The answer really depends on what they eat. Commercial crumbles and pellets are already ground up finely enough that grit isn't required. However, if you feed your chicken's whole grains, scratch or allow them to forage for all or a portion of their diet, then you should provide your flock with grit so that they can digest these larger food particles. Scratch is comprised of larger food particles that require grit. Crumble and pellets are already ground fine enough that chicken's don't need grit to digest them. 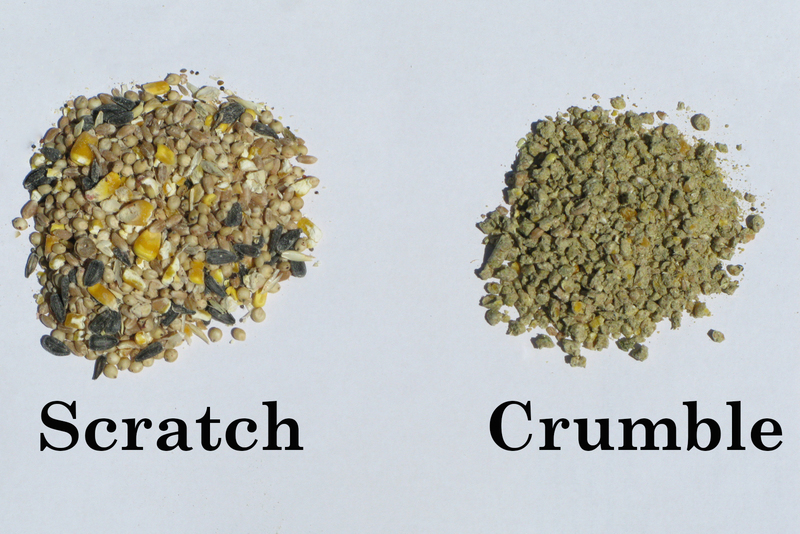 There are two different types of grit sold in the feed store and it's important to buy the right type. In this article we've been discussing the insoluble type (not digested and of no nutritional value). Insoluble grit is composed of small stones, generally granite. The other type of grit is soluble (digestible) and is often made of flaked oyster shells. Soluble grit is a calcium supplement and helps your chicken's build strong egg shells. It dissolves during digestion and will not work to break up larger food particles. 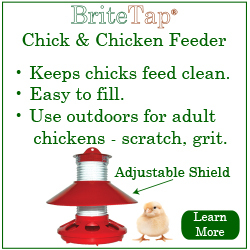 If your chicken's have a diet that requires grit, the soluble kind isn't the right type to use to assist digestion. One other thing that keep in mind is that chicken's generally eat a diet that is very dry. Even free-ranging birds who eat a diet of seeds, insects and vegetable matter will not get enough water from their diet alone to properly digest their food. Water is essential to digestion, so make sure you provide plenty of clean drinking water. 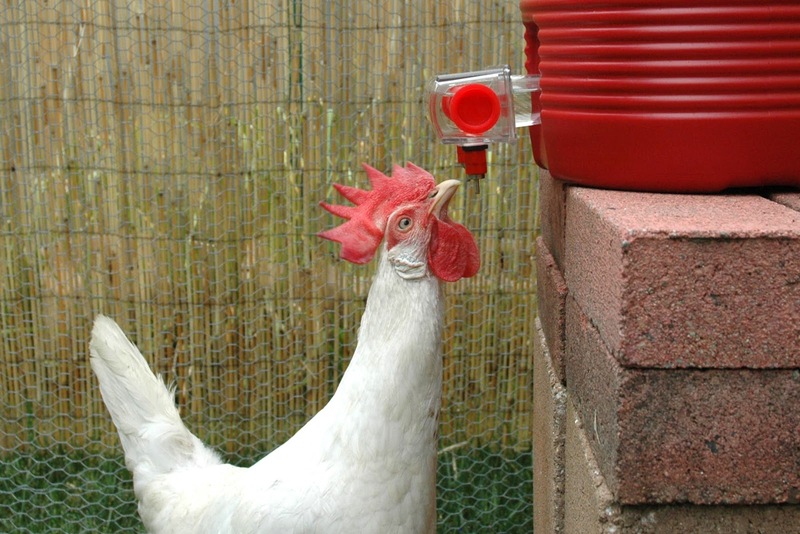 Naturally, we use the BriteTap chicken waterer since it provides a constant source of drinking water free from contamination by dirt and droppings. 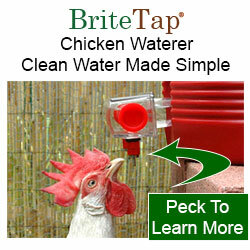 The BriteTap waterer is fully covered and chicken's drink from special valves located on the bottom of the dispenser. 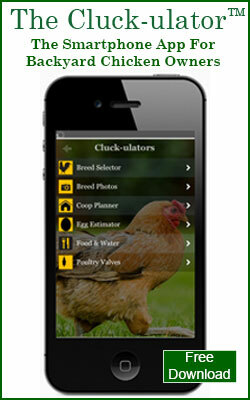 For more information about the BriteTap Chicken Waterer web site.